In the past few years, the Ukrainian economy has been growing rapidly, albeit from a very low base resulting from the dramatic decline in the course of the 1990s. However, in 2005, economic growth slowed down markedly, partly reflecting the disappointing political developments that had set in after the 'orange revolution' in late 2004, but also pointing to the extreme vulnerability of the country's current growth path. By and large, the country's economy remains hostage to the political uncertainty ahead of the parliamentary elections scheduled for 26 March 2006. Ukraine's foreign trade developments over the past few years have been generally characterized by a re-orientation of trade flows towards the non-CIS markets. This has been particularly the case with exports, while the re-orientation of imports has been kept within limits by the country¿s high dependence on imports of energy from Russia. The latter also explains Ukraine's persistently high trade deficit with Russia (although the trade deficit with the EU has been rising as well). Our findings suggest that in trade with the 'old' EU and the new member states (NMS), Ukraine is specializing in a relatively narrow range of not very sophisticated products: notably metals, chemicals, and mineral fuels. However, in its trade with Russia (and to some extent with the Baltic states), Ukraine has strong positions in a number of more sophisticated items such as transport vehicles and machinery and equipment. In accordance with the above findings, the extent of intra-industry trade is low in Ukraine¿s trade with the EU-15 and most NMS, but it is more pronounced in trade with Russia and some less advanced NMS, in particular Poland. 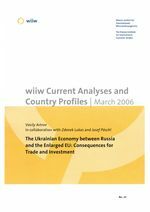 Ukraine's relations with the EU have not advanced very much, although the country has finally been granted the 'market economy' status (December 2005). The EU is still reluctant to acknowledge the country's EU membership prospects - notwithstanding the new accents (positive for Ukraine) brought to the EU's foreign policy by the NMS. At the same time, the fears of economic losses to Ukraine from the EU enlargement proved largely unfounded. The country's exports to most NMS in 2004 were actually higher than the year before, with the exceptions of Hungary and Estonia. Ukraine's agricultural exports to the NMS have performed well and the EU's import quota for steel has been substantially raised. The Common Economic Space between Ukraine, Russia, Belarus and Kazakhstan agreed upon in September 2003 has not advanced very much. The main reason for that is that Ukraine and Russia have very different views as to the speed and the final stage of the planned (re-)integration. While Russia would like to form at least a customs union within the CES framework, Ukraine¿s interest in the project is confined to a free trade area only. The most tangible result of the CES Agreement so far has been the shift to the uniform 'country of destination' principle of indirect taxation of goods traded with Russia, which was expected to bring economic benefits to Ukraine in the form of cheaper energy. However, these expectations have not materialized, and any convergence of Ukraine's domestic energy prices to the Russian (also rising) levels is only possible at the higher stages of integration - which Ukraine is reluctant to enter. Ukraine is expected to accede to the WTO some time in 2006, although the remaining stumbling blocks - particularly the extensive protection of the country¿s agricultural sector - still need to be settled. Generally, Ukraine's agriculture has a great production and export potential due to its rich soil ranking among the best in the world, and the country is already highly competitive in a number of products, notably sunflower seeds. At the same time, the potential in some other products (such as sugar, but also to a certain extent grain) is constrained by the existing trade distortions and insufficient investment resulting from the slow progress in the land market development. In comparison to the NMS and some other Central and East European countries such as Bulgaria and Romania, the inflows of FDI to Ukraine have been meagre. Pervasive corruption, bureaucratic hurdles, delay in the implementation of structural reforms, and - more recently - political instability are behind this disappointing development. The EU share in Ukraine¿s inward FDI stock is low as well, pointing to the low level of Ukraine's integration with the EU also from the investment point of view. However, a turnaround in FDI activity has already started and will probably become even more pronounced following the country's accession to the WTO. Among the sectors likely to be targeted the most are banks, but also agriculture which - provided the land reform is further pursued - may well follow the path of the food processing industry, which has greatly benefited from the inflows of FDI over the past few years.